The latest Property Council of Australia-ANZ Survey reflects a housing market that has stabilised in recent months after losing some momentum following the release of the Commonwealth budget. The Survey reveals an optimistic outlook for the property sector with the Australian Property Confidence Index increasing 4 points to 135 in the December Quarter. Home sales and auction clearance rates remain elevated, supported by improved mortgage service affordability while positive developer sentiment has led a strong cyclical upswing in residential construction. In addition, the Survey shows strong foreign investor demand for Australian housing has also buoyed housing market sentiment and dwelling construction, particularly in Sydney and Melbourne. 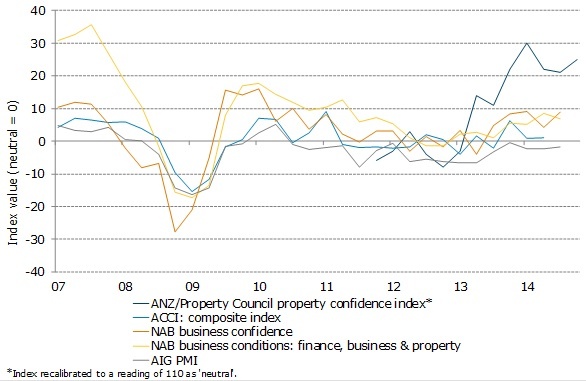 The Index reflected stronger property sector sentiment and expectations of increased business activity in 2015. Across all states and territories, the survey reflects a clear shift in property market momentum in the past 12-18 months towards New South Wales, Victoria and Queensland. 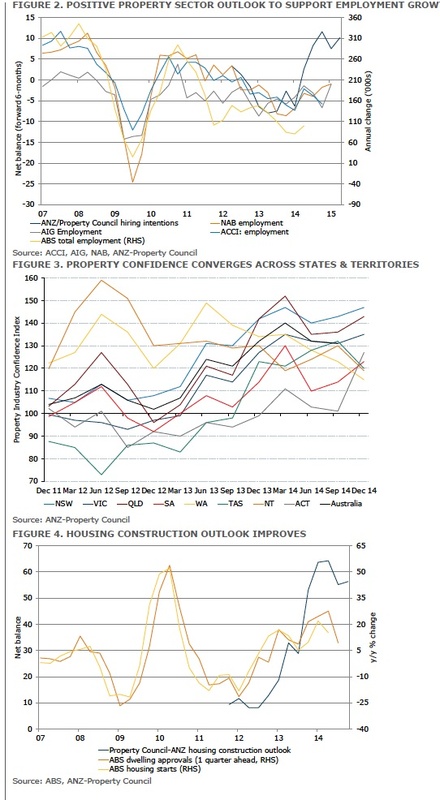 Property sentiment was dominated by the Northern Territory and Western Australia until mid-2013, reflecting the strong economic conditions associated with the mining investment boom. However, in more recent quarters, a more optimistic property sector outlook in New South Wales, Victoria and Queensland have reflected the combined positive impact of solid housing market sales, strong property investor demand and elevated planned building activity in these states. Nonetheless, property sector confidence is positive across all states and territories. The survey reflects stabilisation in housing market sales and solid home price growth in recent months. Looking ahead, the housing market outlook remains positive, given elevated auction clearance rates and home sales, solid house price gains and strong dwelling approvals. In addition, the latest ANZ-Property Council Survey also reveals solid foreign investor housing sales, particularly in New South Wales and Victoria. The detail within the report suggests that the property sector should support economic growth in the year ahead. All questions relating to firms’ own activity, such as hiring intentions and forward work schedule increased in the quarter and are at high levels. This is consistent with solid housing sales and planned construction activity in the major metropolitan centres over the next year. This should support employment growth and eventually a broadening of the non-mining recovery. “Confidence strengthened in the latest ANZ-Property Council Survey and continues to provide an optimistic outlook for the property sector. With elevated hiring intentions and a solid pipeline of work yet to be done, the survey highlights the critical role the property sector is playing in leading the recovery in the non-mining economy. We expect a buoyant housing market and home price gains to provide support to consumer confidence and retail spending, while dwelling construction will take up some of the slack being generated by the downturn in mining and energy investment. Despite some concerns about the potential for excessive house price growth, recent months have seen some moderation in house price growth to more sustainable growth rates. Today’s Survey reports the property sector expects house prices will continue to rise over the next 12 months in every State except the NT. The industry uniformly expects the next move in interest rates to be up. This is in line with ANZ expectations that the RBA will remain on hold for an extended period, before the tightening cycle begins in May 2015.